Occurrence: Hazelnuts occur in praline, chopped nuts, nut spreads and breakfast cereals. Ground hazelnuts can be added to cookies, cakes, and other desserts. Hazelnut oil is also used in cooking. More information.. Allergies to tree nuts and seeds tend to be of a more severe nature, causing life-threatening and sometimes fatal reactions. People with tree nut allergies also often suffer from reactions triggered by a number of different types of nuts, even though they do not come from closely related plant species. In general these allergies are triggered by the major proteins found in nuts and seeds which are resist processes such as cooking. There is also a milder form of tree nut allergy which is associated with birch pollen allergy, where symptoms are confined largely to the mouth, causing a condition called “oral allergy syndrome” (OAS). This condition is triggered by molecules found in tree nuts which are very similar to pollen allergens like the major birch pollen allergen called Bet v 1. These molecules tend to be destroyed by cooking, which can reduce the allergenicity of nuts and seeds for these allergic consumers. Hazelnuts (Corylus avellana) are among the common tree nuts that lead to allergic reactions. They can be eaten as in-shell nuts, however, the majority is cracked, and the kernels are sold to candy makers, bakers and other food processors. Hazelnuts can be found in many food products including cookies, cakes, pastries, chocolates, confectionary products, ice cream, breakfast cereals, and bread. In addition, hazelnut oil may pose a threat to patients with hazelnut allergy, depending on the method of processing with oil undergone less processing at lower temperature tended to be more allergenic. Allergy to hazelnut is often found in patients with hay fever (allergic rhinoconjunctivitis) and tree pollen allergy. These patients usually present with itching, swelling, burning in the mouth and throat after the ingestion of hazelnuts or hazelnut containing products. This so called “oral allergy syndrome” or food-pollen allergy is caused by cross-reactivity between tree pollen allergens, especially birch, alder and hazel pollen, and hazelnut proteins. In addition to the “oral allergy syndrome” severe allergic reactions to hazelnuts are reported in patients without any association to tree pollen allergy. These patients usually display hives (urticaria), swelling of the lips and face (angioedema), breezing difficulties (asthma or swelling of the throat), vomiting, diarrhoea and/or anaphylactic shock. In one study using double blind, placebo-controlled food challenges, the lowest dose inducing symptoms in hazelnut allergic patients was 1 mg of hazelnut protein. After a dose between 30 to 100 mg of hazelnut protein, corresponding to one-third of a nut, all patients had developed an allergic reaction. Most patients in this study suffered from pollen-related food allergy. No data on sensitivity (threshold dosages) are reported so far for patients with severe allergic reactions to stable non-pollen-related hazelnut allergens. Minimum provoking doses could be different in this group and might be even lower. In general, the observed threshold levels equal doses of hidden hazelnut sometimes present in food products. Therefore a precise declaration is necessary to prevent unknown exposure. Methods have been developed appropriate for use in food industry that allow the detection of <10 parts-per-million (milligrams per kilogram) of hazelnut protein. However, globally the usage of such tests is no routine yet. Who, When how long, and how often? For most patients with suspected hazelnut allergy, currently used diagnostic tests, such as blood samples or skin prick tests give no clear-cut diagnosis. Only for highly reactive patients with high levels of nut-specific IgE or large skin test reactions it can be proposed that about 95% of these patients will have clinical reactions upon ingestion of the nut. Most results from allergy tests, however, will lie in a ‘grey area’ beneath these values, but still positive where one could not be certain. These patients may be allergic or tolerant to the tested food. Moreover, variability in the composition of commercial skin prick test reagents for the diagnosis of hazelnut allergy is extreme. Sometimes, allergens important especially for severe systemic reactions to hazelnut are missing in the preparations. These shortcomings in standardization and quality control can potentially cause a false-negative diagnosis in subjects at risk of severe reactions to hazelnuts. Therefore, the gold standard is still the oral food challenge, best in a double-blind, placebo-controlled way. Recipes for hazelnut food challenges have been developed and validated. Patients with diagnosed hazelnut allergy, especially those with systemic reactions, should completely avoid hazelnuts and hazelnut containing products. Currently, patients allergic to peanuts are advised to avoid also all tree nuts, including hazelnuts. Moreover, avoidance of all tree nuts is commonly recommended in patients allergic to any tree nut. Whether these recommendations are useful can be discussed. The elimination of all nuts is very difficult and has a great impact on the lifestyle. In addition, nuts are an important source of protein. It has recently been reported that 55% of patients allergic to one nut were able to tolerate another type of nut. Therefore the clinical relevance of hazelnut allergy should be proven before general avoidance is recommend especially since hazelnut are used in so many common food products. Moreover, infants in risk groups for developing allergy, such as infants with allergic parents or siblings, should avoid these foods in the first few years of life. The success of elimination diets depends on the recognition by the consumer of the offending food in food products. Hazelnut as a tree nut will be identifiable in food products through to the new EU labelling directive that will be used by 2005. It is well know that heating, cooking or roasting can change the ability of a food to elicit allergy. Processed food may be either more or less allergenic. It had been shown for hazelnuts that roasting seems to reduce the reactions at least for birch pollen allergic patients due to the fact that the responsible hazelnut-allergens are destroyed by heat. However, since about 30% of the patients with food-pollen allergy still showed allergic reaction to the roasted nuts, ingestion of roasted hazelnuts or products containing roasted nuts can not be considered safe for hazelnut allergic consumers. Moreover, the risk imposed by roasted hazelnuts to patients without tree pollen allergy but severe systemic reactions to hazelnuts is not known today. Hazelnut-allergens eliciting these systemic reactions belong to the same protein family as the allergens in peanuts. At least for the peanut allergens it is known that roasting increases the allergenicity of these proteins. Nuts i.e. Almond, Hazelnut, Walnut, Cashew, Pecan nut, Brazil nut, Pistachio nut, Macadamia nut and Queensland nut and products thereof are listed in annex IIIa of the EU directive on labelling of foods. The filbert (Corylus maxima) is very similar to the hazelnut. Clinical symptoms observed by Schocker et al. (2004)  in 26 patients included: Oral allergy syndrome in 7 of 26 patients, anaphylaxis (6/26), angioedema (6/26), urticaria (2/26) and food-dependent exercise-induced anaphylaxis in a single patient. 14 patients were reported with systemic symptoms (8 urticaria, 7 respiratory, 6 gastrointestinal, 2 angioedema and 2 OAS) by Beyer et al. (2002) . 31 patients were reported by Wensing et al. (2002)  all of whom showed oral allergy syndrome together with rhinoconjunctivitis (2/31), urticaria (2/31), urticaria, angio-oedema and anaphylactic shock (1/31) and nausea (2/31). Clinical symptoms observed by Ortolani et al (2000)  include : 1) Systemic reactions: anaphylaxis, exercise-induced anaphylaxis, 2) Cutaneous symptoms: angioedema, atopic dermatitis, eczema, rhinoconjunctivitis, urticaria. 3) Gastrointestinal symptoms: angioedema of lips and tongue, diarrhoea, glottis edema, laryngeal edema, oral itching, swelling of lips, tongue and throat, vomiting, oral allergy syndrome, perioral erythema. 4) Respiratory symptoms: allergic rhinitis, asthma, bronchial obstruction, dyspnoea. 5) Other symptoms: migraine. In a study of 172 patients who experienced anaphylactic reactions, 13% reacted towards tree nuts including hazelnut (Pumphrey and Stansworth, 1996 ). Food/Type of allergen:All studies used commercial extracts of hazelnut, Akkerdaas et al. (2003)  comparing 9 commercial extracts. Clark and Ewan (2003)  used a positive (histamine 10 mg/mL) and negative control (saline). SPT wheal diameters were listed as <3 mm, 3-7 mm and >8 mm. Crespo et al. (2002)  used a positive (histamine 10 mg/mL) and negative control (saline) and the SPT was counted as positive if the wheal diameter minus the control was >3 mm. Akkerdaas et al. (2003)  also used a positive (histamine 10 mg/mL) and negative control (glycerol) but counted the SPT positive if the wheal diameter was 0.25 of the positive control. Asero et al. (2002)  studied 600 patients with Rosaceae (apple, pear, peach, cherry, apricot, plum, or almond) allergy and used positive SPT with commercial plum extract; negative SPT with a commercial birch pollen extract; in-vitro IgE reactivity to the 9-10 kDa fraction of peach peel or immunoblot with peach peel showing a single band at 10 kDa; and total inhibition of reactivity to whole peach extract (containing Bet v 1-related allergen, profilin, and LTP) by purified peach LTP on enzyme-linked immunoassay (ELISA) to select 20 patients monosensitised to nsLTPs. Crespo et al. (2002)  studied 15 fruit allergic patients. Akkerdaas et al. (2003)  studied 30 patients, 15 of whom had hazelnut allergy confirmed by DBPCFC. Clark and Ewan (2003)  tested 1000 peanut or tree nut allergic patients and 63 reacted most strongly to hazelnut. Asero et al. (2002)  found that all 20 patients monosensitised to nsLTPs gave positive SPT to the hazelnut extract. Crespo et al. (2002)  reported that 6/15 fruit allergic patients had either a positive SPT or CAP-RAST test to hazelnut. Akkerdaas et al. (2003)  found that the 9 extracts tested gave variable results, probably because they differed in which allergens they contained (the extracts were tested for Cor a 1, Cor a 8 and profilin, thaumatin-like protein and a 38-kD allergen). There were 6/30 false negatives. Clark and Ewan (2003)  found that only 3% of the hazelnut tolerant individuals had a strongly positive SPT with hazelnut (≥8 mm) while (over all nuts) 98% of the allergic individuals had SPT ≥3 mm. IgE protocol:FEIA-CAP (Beyer et al. 2002  and Crespo et al. 2002 ). CAP-RAST (Pastorello et al. 2002) . CAP and EAST (Müller et al. (2000)  and Schocker et al. 2004 ). Müller et al. (2000)  used sera from 27 hazelnut allergic patients and 28 sera from children with positive CAP to both hazelnut and birch pollen. Pastorello et al. (2002)  used sera from 65/67 patients with confirmed allergy by DBPCFC (Ortoloni et al. 2000 ) together with an additional 7 patients from the Milan region who had more severe reactions after ingestion of hazelnut (with anaphylactic reaction by case history). Crespo et al. (2002)  used sera from 15 fruit allergic patients. Beyer et al. (2002)  used sera from 14 patients with systemic hazelnut allergy. Akkerdaas et al. (2003)  used sera from 14 of the 30 patients used for SPT. Schocker et al. (2004)  used sera from 26 patients with a clear history of adverse reactions to hazelnut and without birch pollen allergy. Lauer et al. (2004)  used sera from 65 patients with a positive case history of immediate-type reactions to hazelnuts (39 of 65 of the patients were DBPCFC positive to hazelnuts). Pastorello et al. (2002)  found that 12/65 patients had negative CAP IgE assys for hazelnut while all were CAP positive for Bet v 1 from birch pollen. The additional 7 patients who had more severe reactions after ingestion of hazelnut were all positive for hazelnut but only 2 were positive for Bet v 1 and another for Bet v 2 from birch pollen. These patients had IgE against the nsLTP, Cor a 8. Crespo et al. (2002)  reported that 6/15 fruit allergic patients gave either a positive SPT or CAP-RAST test to hazelnut. Beyer et al. (2002)  found that all 14 sera were positive for hazelnut, 0.75->100 kU/l, and 8 were also positive for hazelnut pollen. Akkerdaas et al. (2003)  found that both the tested commercial extracts (7/9) and their own extract bound variable amounts of IgE from the 14 sera by RAST and RAST inhibition but that two extracts bound significantly more IgE from most sera. Schocker et al. (2004)  found sera from 1/26 patients gave CAP class 5, 4/26 class 3, 14/26 class 2, 2/26 class 1 and 5/26 negative with hazelnut extract. 1/26 sera gave EAST class 3 with rCor a 8, 7/26 class 2, 6/26 class 1 and 12/26 negative. Only 1/26 sera gave class 3 EAST to rCor a 1.0401. Pastorello et al. (2002)  used a 7.5% to 20% gradient 1D-SDS PAGE. Samples were boiled for 5 minutes in SDS with beta-mercaptoethanol. Beyer et al. (2002)  used 2D separation using 7-cm immobilized pH 5-8 gradient strips (Biorad) with urea, CHAPS and tributylphosphine for 17 hours followed by iodoacetamide treatment and electrophoresis on a 4-12% gradient gel (Bis-Tris ZOOM, Ivitogren, Carlsbad, Calif.). Schocker et al. (2004)  separated hazelnut extract (20 µg/cm total protein) and recombinant nsLTP (0.5 µg/cm) using NuPAGE-Bis-Tris gels (10%; Novagen, Groningen, The Netherlands) under nonreducing conditions. Lauer et al. (2004)  separated purified nCor a 11 and rCor a 11 (1.5 µg/cm), rCor a 1.04 (0.5 µg/cm), rCor a 2 (0.5 µg/cm) and rCor a 8 (0.5 µg/cm) by Tricine SDS/PAGE. Reducing conditions were used for nCor a 11 and rCor a 11 and rCor a 8 was treated under non-reducing conditions. Pastorello et al. (2002)  transferred proteins to nitrocellulose paper (Amersham) or PVDF membranes (ProBlott, Applied Biosystem, Foster City, Calif.). The nitrocellulose was blocked, cut into strips and incubated overnight with sera. IgE was detected with iodine 125 labelled anti-human IgE (Pharmacia & Upjohn) diluted 21:5 in blocking solution and X-ray film at -70 degrees C for 4 days. Schocker et al. (2004)  transferred proteins onto nitrocellulose membranes (Schleicher and Schuell, Dassel, Germany). Serum samples were pooled and diluted 1:20 in PBS containing 0.05% Tween 20. The bound IgE antibodies to hazelnut extract were detected by incubating the strips with iodine 125–radiolabeled sheep anti-human IgE (SH25-1-p7; Sanquin, Amsterdam, The Netherlands). Lauer et al. (2004)  transferred proteins on to nitrocellulose membranes (0.2 µm) by semi-dry electroblotting. The membrane was blocked in Tris-buffered saline with 0.3% (v/v) Tween 20 and incubated with 1:10 (v/v) diluted patients' sera. Bound IgE antibodies were detected by enzyme-coupled anti-human IgE followed by enhanced chemiluminescence (Pharmacia). The amount of total protein transferred to the membrane as well as blocking method were generally critical for the result (Vieths, S., personal communication). Müller et al. (2000)  report the profile of IgE reactivity of sera from both groups (27 and 28 patients) against raw hazelnut extract. Bands were detected at 11-12, 18-19, 10-22, 24-24, 38-39, 43-44, 48-52 and >60 kDa (also cross-reactive carbohydrate at >50 kDa). 93% and 79% of sera in the two groups detected the 18-19 kDa band. 12 sera from hazelnut allergic patients were tested with raw and roasted hazelnut extracts. IgE from 11/12 sera reacted to a 17-18 kDa band in raw hazelnut extract, which completely disappeared using roasted hazelnut. IgE from 6/12 sera bound to a 48 kDa band from raw hazelnut extract. 4 of these 6 sera were CAP positive to roasted hazelnut and also detected proteins between 36 kDa and 90 kDa from roasted hazelnuts on immunoblots, including a 43 kDa band. Müller et al. also described a heat-stable hazelnut allergen with a mass below 14 kDa that was recognised by IgE from one patient. Pastorello et al. (2002)  found 63/65 patients had IgE specific for the 18 kDa allergen, 62/65 for a 47 kDa, 36/65 for a 32kDa and 33/65 for a 35 kDa allergen. The IgE binding to the 18 Kda allergen was completely inhibited by birch pollen extract as was binding to one 14 kDa band. IgE binding to the higher molecular wt. allergens was also inhibited. The 7 extra patients from Milan all reacted to the 9 kDa allergen Cor a 8. This was not inhibited by birch pollen extract but was by peach extract and by peach LTP. Beyer et al. (2002)  found that 12/14 patients (86%) had IgE recognising Cor a 9 at 40 kDa. Akkerdaas et al. (2003)  identified an allergen running at 38 kDa in 6 of the commercial hazelnut extracts and in their own extract which bound IgE from pooled sera. A 2S albumin with cross-reactivity to Ber e 1 was also observed in some extracts. Schocker et al. (2004)  found that 16/26 patients' sera displayed IgE reactivity to a 9 kDa protein in hazelnut extract. 2/16 sera detected binding above 20 kDa in addition to the 9 kDa protein. 1/26 sera contained only IgE antibodies to Cor a 1.04 at 18 kDa. Lauer et al. (2004)  found that rCor a 11 and nCor a 11 bound IgE from 43% and 47% of the 65 serum samples respectively. These authors also reported that 98.5% had IgE to the major allergen, rCor a 1.04; rCor a 2 was recognized by IgE from 15.4% of the sera, whereas no reactivity was found towards rCor a 8 (LTP). rCor a 1.04 and rCor a 2 had strong IgE reactivity, resulting in intensive bands, whereas often a weaker signal for Cor a 11 was observed. Ground dried hazelnuts were used except Skamstrup Hansen et al. (2003)  who also used ground roasted hazelnuts. Wensing et al. (2002)  used seven doses of 1mg, 3mg, 10mg, 30mg, 100mg, 300mg and 1g of hazelnut protein (corresponding to 6.4, 19, 64, 190, 640, 1900 and 6400mg of hazelnut meal, respectively). These doses were completed with a mixture of 0.67g/g dry oatmeal flakes, 0.33g/g brown sugar and 0.0033g/g salt up to a total weight of 15g per test meal. The placebo doses consisted of oatmeal flakes, brown sugar and salt alone. Just before administering, the test meal was mixed with water of a temperature of 40-50°C to obtain oatmeal porridge. All patients were noseclipped while eating the test meals. Blind:DBPCFC. Wensing et al. (2002)  note that the two highest doses did show colour due to hazelnut but all reactions in fact occurred with lower doses. Crespo et al. (2002)  reported 3 positive challenges after excluding a patient with a history of anaphylaxis from 6 patients with positive SPT or IgE test. Skamstrup Hansen et al. (2003)  tested 17 hazelnut allergic patients. Schocker et al. (2004)  challenged 8 patients. Wensing et al. (2002)  used 1 mg, 3 mg, 10 mg, 30 mg, 100 mg, 300 mg and 1 g of hazelnut protein (corresponding to 6.4, 19, 64, 190, 640, 1900 and 6400 mg of hazelnut meal, respectively). 4 patients reacted to the lowest dose. The dose corresponds to the initial subjective reaction. From the dose response curve, 50% of a hazelnut-allergic population will suffer from an allergic reaction after ingestion of 6 mg.
Ortolani et al (2000)  found that of 86 patients, 67 (77.9%) had a positive DBPCFC, 8 were placebo responders and 11 were non responders. Of these 59 had OAS, 3 oral and gastrointestinal symptoms and 5 oral and systemic symptoms. Wensing et al. (2002)  found 29/31 patients reacted and one additional patient reacted to both hazelnut and placebo. All reacters showed itching of the mouth as the first symptom, one showed generalized urticaria and lip swelling and another slight lip swelling at 1mg. dose. Some gastrointestinal symptoms, abdominal pain and nausea, were also reported. The challenge was continued until objective symptoms were observed or subjective symptoms persisted for 1 hour (7 patients). 1 patient's challenge was ended after subjective symptoms because of anxiety. Skamstrup Hansen et al. (2003)  found that 5/17 patients reacted to roasted hazelnut with OAS while all 17 reacted to raw hazelnut (as Ortolani et al 2000 ). The median dose for reaction was more than doubled for roasted hazelnut. Schocker et al. (2004)  used challenge to diagnose 7 patients reporting oral allergy syndrome and one reporting excercise induced anaphylaxis. Pumphrey et al (1999)  showed that patients allergic to one of peanut, Brazil nut and hazelnut often have IgE reacting to one of the other nuts. Beyer et al. (2002)  found that the 14 patients with systemic symptoms also often reacted to other nuts especially walnut and peanut. Clark and Ewan (2003)  studied 1000 patients who were allergic to peanut or a tree nut. 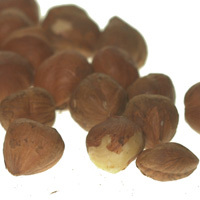 127 patients who were allergic to another nut could tolerate hazelnut. This was 41% of the patients for whom the clinical history showed clear evidence of tolerance of hazelnut or allergic reaction to hazelnut. Hazelnut allergy is associated with pollen allergies. Thus of 101 birch pollen and/or hazelnut sensitive patients, 72% were sensitive to hazelnut (SPT) (Andersen and Lowenstein, 1978 ) . Jankiewicz et al. (1996)  evaluated data from 167 patients with pollen allergy (97 % of patients were sensitized to birch) and sensitization to at least one plant derived food. 90% of the subjects (n=151) had IgE against hazelnut, whereas only 78% (n=131) had a positive case history of adverse reactions after ingesting hazelnut. In a study of 262 fruit and/or vegetable allergenic patients, 37 % had a positive clinical history of hazelnut allergy (Ortolani et al 1988) . In another study of 65 fruit allergic patients, 4 were allergic to hazelnut (Crespo et al. 2002 ). There appear to be at least three different types of hazelnut allergy. One is associated with birch pollen and involves Cor a 1 (Hirschwehr et al. 1992 ). This is reduced by roasting and mostly causes relatively mild symptoms, OAS. Another is associated with allergy to the nsLTP, Cor a 8. This is most frequently found in the Mediterrean area and is associated with severe symptoms and may be a cross-reactive allergy with peach. There is also allergy to the 11S seed storage globulin, Cor a 9, which may cause severe symptoms and cross-reaction to other nuts. The 7S vicilin Cor a 11 may also be involved in cross-reaction to other nuts. There are other less well characterized allergens. The Clinical spectrum of anaphylaxis in north-west England. IgE binding to unique hazelnut allergens: identification of non pollen-related and heat-stable hazelnut allergens eliciting severe allergic reactions. Hirschwehr R, Valenta R, Ebner C, Ferreira F, Sperr WR, Valent P, Rohac M, Rumpold H, Scheiner O, Kraft D.
Identification of common allergenic structures in hazel pollen and hazelnuts: a possible explanation for sensitivity to hazelnuts in patients allergic to tree pollen. Identification of hazelnut major allergens in sensitive patients with positive double-blind, placebo-controlled food challenge results. Beyer K, Grishina G, Bardina L, Grishin A, Sampson HA. Akkerdaas JH, Wensing M, Knulst AC, Krebitz M, Breiteneder H, de Vries S, Penninks AH, Aalberse RC, Hefle SL, van Ree R.
How accurate and safe is the diagnosis of hazelnut allergy by means of commercial skin prick test reagents? Wensing M, Penninks AH, Hefle SL, Akkerdaas JH, van Ree R, Koppelman SJ, Bruijnzeel-Koomen CA, Knulst AC. The range of minimum provoking doses in hazelnut-allergic patients as determined by double-blind, placebo-controlled food challenges. Pumphrey RS, Wilson PB, Faragher EB, Edwards SR. Specific immunoglobulin E to peanut, hazelnut and brazil nut in 731 patients: similar patterns found at all ages. Hansen KS, Ballmer-Weber BK, Luttkopf D, Skov PS, Wuthrich B, Bindslev-Jensen C, Vieths S, Poulsen LK. Roasted hazelnuts--allergenic activity evaluated by double-blind, placebo-controlled food challenge. Andersen KH and Lowenstein H.
An investigation of the possible immunological relationship between allergen extracts from birch pollen, hazelnut, potato and apple. Ortolani C, Ispano M, Pastorello E, Bigi A, Ansaloni R.
Schocker F, Luttkopf D, Scheurer S, Petersen A, Cistero-Bahima A, Enrique E, San Miguel-Moncin M, Akkerdaas J, van Ree R, Vieths S, Becker WM. Recombinant lipid transfer protein Cor a 8 from hazelnut: a new tool for in vitro diagnosis of potentially severe hazelnut allergy. Interpretation of tests for nut allergy in one thousand patients, in relation to allergy or tolerance. Müller U, Lüttkopf D, Hoffman A, Petersen A, Becker W-M, Schocker F, Niggemann B, Altmann F, Kolarich D, Haustein D, Vieths S.
Allergens in native and roasted hazelnuts (Corylus avellana) and their cross-reactivity to pollen. Lauer I, Foetisch K, Kolarich D, Ballmer-Weber BK, Conti A, Altmann F, Vieths S, Scheurer S.
Hazelnut (Corylus avellana) vicilin Cor a 11: molecular characterization of a glycoprotein and its allergenic activity. Allergic sensitization to native and heated celery root in pollen sensitive patients investigated by skin test and IgE binding. http://us.expasy.org/cgi-bin/niceprot.pl?Q39454 are found in pollen. Cor a 1.04 is thermolabile and rapidly denatures after heating (Wensing et al 2001 ; Vieths et al 1998 ; Schocker et al 2000 ). Although Pastorello et al. (2002)  reported that roasted nuts did not inhibit IgE binding to the 18 kDa allergen (EAST inhibition), Skamstrup Hansen et al. (2003)  reported that roasting of the nuts at 140°C for 40 min did not completely remove IgE binding but reduced it by a factor of 100. The protein is also broken down readily by proteases, with pepsin treatment of hazelnut extract resulting in an almost complete loss of Cor a 1 (Vieths et al. 1999 ; Akkerdaas et al 2000 ). Nature of main cross-reacting proteins:As a consequence of the homologies found between PR10 proteins in birch (Bet v 1), apple (Mal d 1), apricot (Pru ar 1), cherry (Pru av 1), hazelnut (Cor a 1) and other vegetable sources, there is IgE crossreactivity. In most cases Bet v 1 seems to be the sensitizing agent. Allergen properties & biological function:Cor a 1.04 is member of the Pathogenesis Related (PR10) proteins. These may have a role in plant protection against insect pests and microbial pathogens. This probably involves the steroid binding demonstrated by Neudecker et al. (2001)  and Markovic-Housley et al. (2003) . Cor a 1.04 can be affinity purified from hazelnut PVPP extract with Bet v 1 crossreactive mAb 5H8 (Akkerdaas et al. unpublished data). Recombinant Cor a 1.0401 has been expreseed in E. coli as a 73 kDa intein fusion protein. This was loaded onto a chitin column, washed and treated with 30 mM DTT at 15°C overnight for the cleavage reaction and the 18 kDa Cor a 1.0401 eluted. Yields were 0.6 to 1.3 mg/l of bacterial culture (Lüttkopf et al. 2002 ). Q39454 (Cor a 1) and Q9FPK2 (Cor a 1.0402) are 71% identical and the other Cor a 1.04 sequences are 70% identical to Q39454. The level of identity between Cor a 1.0401 (or the very similar sequences Q9FPK2, Q9FPK3, Q9FPK4, Q9SWR4) and the pollen sequence originally called Cor a 1 (MPAA_CORAV or Q08407) is only 53%. MPAA_CORAV and Q39454 are 64% identical. Lüttkopf et al. (2002)  report that the N-terminal sequence of natural Cor a 1.04 from immunoblots was GVFEYEDEATSVIPP which is identical to the recombinant protein except at position 4 (E4C or E4S). Lüttkopf D, Müller U, Skov PS, Ballmer-Weber BK, Wüthrich B, Skamstrup Hansen K, Poulsen LK, Kästner M, Haustein D, Vieths S.
Comparison of four variants of a major allergen in hazelnut (Corylus avellana) Cor a 1.04 with the major hazel pollen allergen Cor a 1.01. Characterization of non-pollen-related hazelnut allergens. Factors influencing the quality of food extracts for in vitro and in vivo diagnosis. Determination of threshold levels of patients with hazelnut allergy using double-blind placebo-controlled food challenges (DBPCFC's). Neudecker P, Schweimer K, Nerkamp J, Scheurer S, Vieths S, Sticht H, Rosch P.
Allergic Cross-reactivity Made Visible. Solution structure of the major cherry allergen Pru av 1. Markovic-Housley Z, Degano M, Lamba D, von Roepenack-Lahaye E, Clemens S, Susani M, Ferreira F, Scheiner O, Breiteneder H.
Crystal structure of a hypoallergenic isoform of the major birch pollen allergen Bet v 1 and its likely biological function as a plant steroid carrier. Vieths S, Reindl J, Mueller U, Hoffmann A, Haustein D.
Digestibility of peanut and hazelnut allergens investigated by a simple in vitro procedure. Allergen epitopes:The peptide epitopes are not known. Clinically significant carbohydrate epitopes were excluded as rCor a 11 binds IgE to a similar extend to native Cor a 11, binding to the same sera with slightly weaker binding by ELISA. The basophil histamine release test also showed that carbohydrate epitopes were not required. Nature of main cross-reacting proteins:Lauer et al. (2004)  note that the sequence suggests that the possibility of cross-reactivity with Ara h 1 should be investigated. Allergen properties & biological function:Cor a 11 is a vicilin and is likely to be a 7S seed storage protein in hazelnut although homologues also act as sucrose-binding proteins. Cor a 11 is a glycoprotein (Lauer et al. 2004) . Freeze-dried hazelnut extract was dissolved to a protein concentration of 4 mg/ml and dialysed against starting buffer (50 mM Tris/HCl, pH 8). After filtration through a 0.45 µm filter (Sartorius, Göttingen, Germany) the protein solution was applied to a 20 ml HiPrep 16/10 DEAE FF column (Amersham Pharmacia Biotech, Uppsala, Sweden). Bound proteins were eluted with a linear salt gradient (50 mM Tris/HCl, pH 8, 1 M NaCl) at a flow rate of 5 ml/min. Further purification of the eluted fractions was performed by concanavalin A affinity chromatography (Amersham Pharmacia Biotech) in 20 mM Tris/HCl (pH 7.3)/0.5 M NaCl. Elution was carried out with alpha-D-methyl-mannoside (10, 25, 50 and 100 mM) (Sigma\ZAldrich, Steinheim, Germany). Fractions (0.5 ml) were analysed by SDS/PAGE and immunoblotting and the protein was found to be approximately 98% pure (Lauer et al. 2004) . Recombinant Cor a 11 was expressed using a pET100D construct in E. coli BL21 Star cells (Invitrogen). Protein synthesis was induced with 1 mM isopropyl beta-D-thiogalactoside for 5 h at 37 °C. Bacteria were harvested by centrifugation (3000xg, 20 min, 4°C) and stored at -80°C. The pellet from a 1-litre bacterial culture was resuspended in lysis buffer (50 mM NaH2PO4, 500 mM NaCl and 2 mM imidazole, pH 8) and subjected to three freeze\Zthaw cycles using liquid nitrogen (frozen 3 times in liquid nitrogen). rCor a 11 was purified by metal-chelate affinity chromatography using a commercial kit (Qiagen) (Lauer et al. 2004) . Pastorello et al. (2002)  define the 47 kDa allergen, which has the Cor a 11 N-terminal sequence, as major whilst Lauer et al. (2004)  found that less than 50% of their sera contained reactive IgE to Cor a 11. Process, chemical, enzymatic:Most LTPs are relatively stable to heating and proteolysis (Asero et al. 2000 ) whilst the stability of hazelnut ns-LTP has not been characterised. Wigotzki et al. (2000)  found that a hazelnut allergen <14 kDa was very stable to heating. Pastorello et al. (2002)  have shown that extracts from both native and roasted hazelnuts inhibit IgE binding from Cor a 8 sensitised patients to native hazelnut by EAST inhibition assay. Nature of main cross-reacting proteins:Not known. However, cross-reactivity with other ns-LTPs is likely. Allergen properties & biological function:Non-specific lipid transfer protein, nsLTP. May be involved in wax or cutin deposition. LTPs have four alpha-helices around a central expandable cavity which binds lipid. The helices are linked by four disulphide bridges. nsLTPs have also been reported to act as plant defense proteins against bacterial and fungal infections and form the PR14 family of pathogenesis related proteins. Schocker et al. (2004)  partially purified Cor a 8 by ion exchange chromatography using DEAE Sepharose Fast Flow Resin with an elution buffer of 20 mmol/L Tris and 0.5 mol/L NaCl, pH 8.0. Schocker et al. (2004)  also expressed complementary DNA encoding the mature protein Cor a 8 in E coli BL21(DE3) RIL cells at 30°C for 2 hours. Purification was performed under native conditions by means of metal affinity chromatography. Approximately 1.5 mg of recombinant protein was purified from 1 L of bacterial culture. Wigotzki M, Steinhart H, Paschke A. Influence of varieties, storage and heat treatment on IgE-binding proteins in hazelnuts (Corylus avellana). Allergen epitopes:Not known but the acid subunit has been identified as the main IgE binding region. Process, chemical, enzymatic:Not known but likely to be thermostable like other 11S seed storage globulins. Allergen properties & biological function:Cor a 9 is probably a hexameric seed storage protein. Subunits are synthesised as a precursor which is cleaved into two disulphide linked subunits of approximately 20 kDa and 40 kDa, before forming the hexamer. Beyer et al. (2002)  used two 2 peptide sequences from the 40 kDa band, QGQQQFGQR and HFYLAGNPDDEHQR, to determine the sequence Q8W1C2. The N-terminal sequence from Pastorello et al. (2002)  matches that from residues 23-37 of sequence Q8W1C2 with two changes.